On Sunday, September 25, HJJCC members participated in the fifth annual Prayers on Wings Fundraiser at Salt Lake Elementary School. HJJCC members challenged participants at giant Jenga and Tic Tac Toe! We had a great time supporting Prayers on Wings. On Sunday, October 11, 2015, the HJJCC participated in Adopt-A-School Day at Keoneula Elementary School in Ewa Beach. Members helped paint the school driveway and cleaned up weeds and debris in the garden and hydroponics area. Thank you to all the members that came out this morning to volunteer! We hope everyone enjoyed our second mixer of the 2015-2016 year. There were a bunch of new faces, so I'm sure you all met someone new! If you want to get involved with HJJCC please contact us at membership@hjjcc.com. Please save Wednesday, December 2, 2015, for our Holiday Mixer at Nocturna! More details to come! 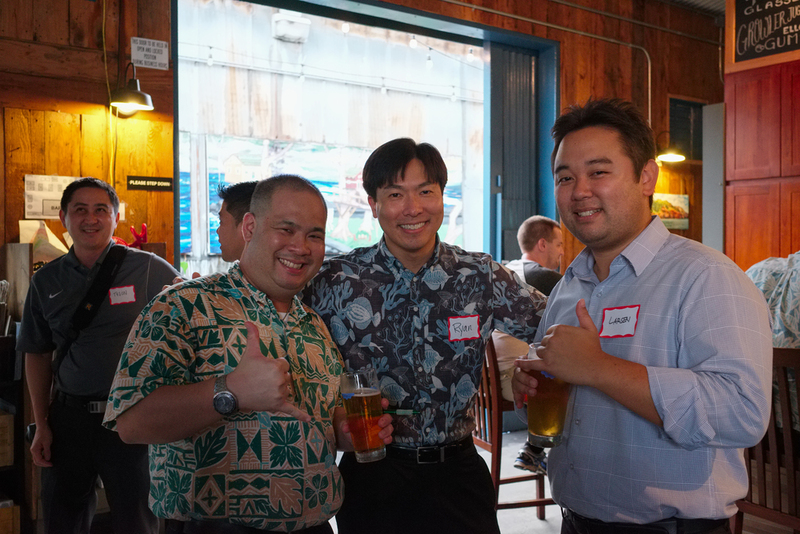 On August 26, 2015, Members of the HJJCC met for the first membership mixer of the year at Honolulu BeerWorks. It was a great opportunity for new members to meet the board and learn more about our organization. We'll be planning more mixers in the future, so stay tuned for details!